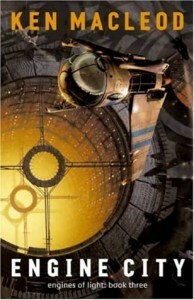 The third – and final – book in the “Engines of Light” series is “Engine City”. While on a routine survey mission of a nearby star system, Gregor Cairns' wife Elisabeth discovers the corpse of a large spider-like alien being. Matt Cairns and his associates realise that an interstellar war may soon be on the horizon. Earlier on, Matt's rival Volkov had flown off to the ancient trading Nexus of Nova Babylonia. His aim is to overthrow the millennia-old traditional government and replace it with a new, more progressive government that is capable of organising the technological force to fight off the threat of the 'Multipliers', as the Spider-aliens are named. However, Matt begins to doubt that the Multipliers are really the threat that Volkov thinks they are, despite the asteroid-Gods' millennia-old antipathy to the Multiplier race. It all ends up with a military confrontation on Nova Babylonia, as Matt and his multiplier allies must somehow deal with the remnants of Volkov's military regime (now leaderless after their leader's assassination). However, is Matt doing the right thing? Whereas “Dark Light” could be criticised for a comparative lack of ambition, this novel has plenty of fascinating ideas. Rather than the traditional political and technological concepts that usually take precedence in MacLeod's novels, he decides here to focus on the potential of an utterly alien race. The Multipliers are fascinating, if outlandish, creatures, ranging in scale from human-sized creatures down to tiny clones of the larger Multipliers that effectively function as biological nanobots. These tiny creatures allow the Multipliers to offer the humans a seductive choice – if they allow the nanobots into their bloodstream they will gain immortality – as well as increased cognitive abilities and a greater sense of togetherness. The benefits are obvious – but they lead to the dilemma of whether the Multipliers can be trusted, and are the humans that accept the treatment still fully human? It's an intriguing question, especially given the lack of a definitive answer. There are also plenty of other interesting ideas, as well as an entertaining plot, some good characters and quite a bit of humour. The writing is among MacLeod's best, and the only real criticism might be that the plot does bounce around a lot from place to place, making a bit challenging to follow at times and it does occasionally feel slightly rushed trying to cram so much plot into a relatively short book. In summary, “Engine City” is a superb work of science fiction, packed with intriguing ideas and with a highly entertaining plot. The previous two books in the trilogy may not have been MacLeod's best, but this surpasses them and ends up as a potential future classic of the genre.